SRO GALLERY is pleased to present six painters in the exhibit: ‘Unextinguished, The Episodic Landscape’. Unextinguished: unquenched, not ended, still living observed, tokens of unextinguished or returning passion. The six artists presented in this exhibit create landscape as a receptacle for the display of personal encounters, the experience of tone, and for some, a refusal to be a landscape as a starting point. Seen as landscape, their work wanders into seemingly unrelated topics, creating episodic experiences that the viewer is free to interpret; imagination and intimacies are exposed, touched with morality; there is underlying sentiment regarding global warming and the human impact on our natural environment. The paintings of these artists, one might argue, could not be more different as the show regards their interest within the landscape genre. Yet strikingly compatible are the essences found in each painting. With affinities for their intoxicating and feverish singular visions they have found a common directness of expression and have achieved a like-kind spiritual lyricism. Like Hansel and Gretel their journeys are emblematic of losing control, of a kind of abandonment and the attempts at placing markers so as to find one’s way, to negotiate the seen and the unseen with momentary emphases on a kind of delirium. Forests surge magical fields and menacing streams through a wooded subconscious. Like a Folk Tale, to guide us through the dark woods, the paintings here at SRO are a natural form to carry a veiled symbolism, neither self explanatory nor self conscious, that introduce secrets, but are in no way secrets unto themselves. To conflagration in the upper air. All distant shapes turn brighter to the gaze. Of flesh, burn backward to a blackened heap. Until thought crackles white across the brain. 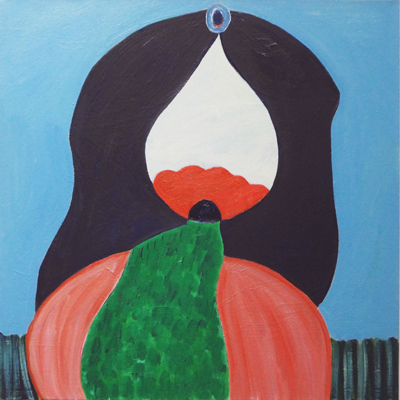 Cathy Diamond creates rhythms and linear characters as if in animation around her, trying to express living presences in an otherwise abstract arena. The marks simultaneously suggest figures in cage-like structures; comfortably ensconced and yet struggling to get in or out of the canvas. Suggestive tree-forms gain traction with slumbering cloud-rock forms above, holding the weight of the sky in a barely visible dusk light. Narrative elements arrive for her this way after the initial automatic drawing inhabits the canvas. You lose touch with the possibility for clarity. There is a barely contained impulsive display in her works for destruction or adaptation, a skill of burnishing the details in every figurative relationship. A philosophical dilemma, within each brutalist canvas forces the self to deepen the space, complicate it, and return eventually to reserve. Diamond’s Paintings are opening up to little theaters, like intimate drawing diaries, as she creates tableaus. She affects a richness of muted atmospheric feeling and a fullness of color. These works are imbued with a strange emotional character created by the tense animated plant forms redolent of a forest background. Cecilia Whittaker-Doe has not been viewing memories of her youth in upstate NY with a composing eye. While her overstated vegetation evokes analogies to the forests, rocks, spring fed streams of Putnam Valley, they can be an analog transposing nature into an ecstatic exaggeration of itself. And perhaps, grounding an argument for faith. Doe is concerned with giving form to spiritual ideas often drenched in sensual allusions or referencing nature’s upheavals to find analogies in her symbols. We can only trace her influence to Charles Burchfield. In her studio removed from the source of time and place, Nature is exaggerated; the river banks become steeper, the downward progression more abrupt yet without an inkling of the danger submerged in the headlong torrent of the stream rushing downward to greet and dodge trees rushing to meet some thistle or forget-me-not, comfortably intermittent at the edge of the panel. Contrast between the desecrated tree and the blooming tree indicates the opposition: between redemption and sin? No, opposites they are, but their identity could be either or neither, for Whittaker-Doe plays within the symbols of Nature in art but never preaches beyond regeneration and rebirth. There is no straight and narrow path, and in recent works no path at all in her works, at best you get a foothold. Yet it is clear that in the tangled dicey contradictions of sensory evidence of her paintings there is a Zen spot, hypothetically speaking, a hidden cove offering safe haven. For others her work is a call to action but its not precisely the ‘now’ that Whittaker-Doe is painting. Sahand Tabatabai’s recent work is based partly upon the surviving monuments of Persian art notable for a tradition concentrating on the general Islamic style of dense decoration geometrically laid out, into a harmonious style combining motifs derived from plants, architecture and fundamental structures described by Particle Physics. In previous paintings Tabatabai has used the latticework of brush strokes to build geometric forms, out of which emerge faint landscapes that dialogue with the Iranian folklore he embraces: a house, a shore, a family, a constellation, a mud wall, to create paintings of incremental, seemingly endless possibility. In these newest works, a particular narrative has evolved—contained in these traditional stretched canvases—a cumulative transformation of the mythic. These paintings hint at a darker, perhaps more perfect world, where night melts into abstract Persian dreams, referencing Van Gogh, German expressionists like Feininger and Kupka, or Jack Tworkov. Tabatabai has imbedded conceptual ideas into his portrayal of the Cottonwood tree near his studio in Colorado. He has a system, but also something arises from the combination within beautiful metaphysical and occultist anxieties of his sight, concerned with giving form to spiritual ideas. Cathy Nan Quinlan seeks the immediate experience of her Brooklyn neighborhood for her paintings. She paints what is regarded as simple examples of human encounter with environment; an undeniable weed’s vigorous growth in the concrete cracks gazing up at a sky of clouds. Obvious flowers in some of the paintings have variables, as does reality, each plant holds a section of the view and is developed as an individual structural composition. Each has its own true or false outstretched hands wondering “what is”, like in the child’s game Blind Man’s Bluff. In Quinlan’s paintings weeds seem to take on a life/death meaning addressed through both, the muted and the vibrant color of her palette and the wirey plant forms that explode through their situation. We could be in a pastoral field or a city block, the “where” being more about our own perception. Surfaces appear to be made up of momentary glimpses of light. Her vision is complex, sorted out, then considered again where new relationships form. Vegetation asserts its growth and within this visual complexity passages are developed that convey a kind of pastoral hope. Moses Hoskins’ paintings are less primitivistic than electric and sophisticated in style. Hand drawn curves lie beside and ”mess” with the carefully sustained paint washes; crippled stuff that is more representative of his reality. He is looking for the Gestalt harboring within the joined forms of the environment of these curved lines whose source seems drawn from a Stereotomy book on stone cutting. It’s worth noting that Moses often uses the “good snap” of a caulked string to get a straight line, as would a mason cutting a stone. Within the baroque movement of the line works is a “Care vs. lack of care” momentum that intuitively moves the lyricism within the loose landscape. The drawn curves are real without being actual, in the sense that they impact on the actual ‘mess”, not causally, but by infiltrating it, corralling it, or swarming behind the washed veil of paint affecting a scene of landscape. Hoskins creates a cascade-like fugue that dominates each work liken to a figurative contour remembered. Hoskins is adding and subtracting visual data either to restructure or cripple the whole, keeping wide of being dull, until the combined impulses have angled out a mettlesome potential balance. An intuitive feel for balance point construction yields variables Piero della Francesca would envy. 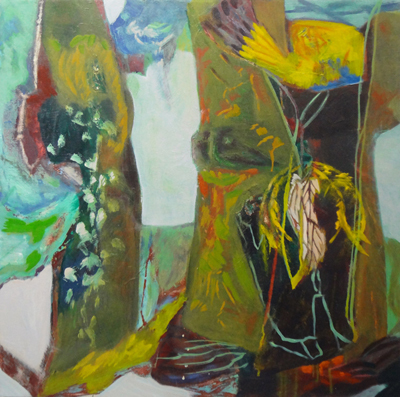 Sheila Lanham’s paintings, like Hoskins’, tend towards the rhythmic pattern and abstract rather than the brutalized forms and color of Doe, Quinlan and Diamond. Lanham’s paintings seem to record, as event, both the tribal and intimate. Like we were walking along a sandy path by flashlight at night to listen to spoken words in the jungle. We never make it to the jungle, being hypnotized instead by the anthropomorphic revealed to us through Lanham’s personal symbolism. Forms pile up vertically, like totems, while at the same time alluding to a felt horizontal distance. We move through the wholeness of the form, made up of smaller shapes, and find ourselves climbing over as well. The centralized motif brings to mind paintings by Georgia OKeeffe, or the abstracted Nature motifs of the modernist landscape artist Arthur Dove. A symbolic color effect, what Dove called “a condition of light”, is apparent in all of Lanham’s paintings. In both Hoskins’ and Lanham’s paintings a personal vocabulary alluding to landscape wanders into seemingly unrelated topics, creating episodic experiences, often surrealistic, that the viewer is free to interpret. Each of the painters in ‘Unextinguished, The Episodic Landscape’ returns to elements of landscape to immerse the viewer in a meditative environment that, like a poem, uses metaphor, personal symbolism, rhythm and the abstraction of natural patterns to form narrative.